Hospice care is all about comfort. Freedom from pain. The security of being in one’s own home, surrounded by loving family members. Hospice does not make a person’s life longer or shorter. But it does strive to make the final days/weeks/months of a person’s life better. Hospice works to relieve a patient’s physical pain and emotional pain. Hospice not only benefits the patient, it also benefits the family. 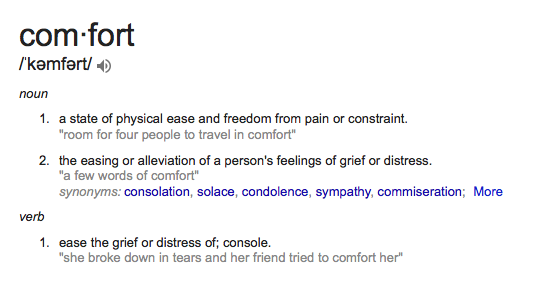 The second definition of “comfort” in the illustration above speaks of the easing of a person’s feelings grief or distress. Spiritual support and counseling is available for hospice patients and family members. Hospice nurses and doctors provide patient comfort by alleviating pain with medications, including narcotic medications. Experienced personnel know which medications are right for which particular pain. They also know the side effects that may occur. It is a myth that morphine is only administered when a patient is very close to death. The level of pain is the determining factor regarding morphine and its dosage amount. Again, the goal is patient comfort. Whether Hope Hospice administers care to a patient in a private home or in a care facility, patient comfort is the top priority. Because certain aggressive treatments can be painful and stressful, simply ending those treatments and handing care over to your hospice team can lead to increased patient comfort (even before medications are administered). To learn more about hospice care and ways that hospice can help provide patient comfort, please call Hope Hospice at 314-984-9800.